Go, Tracy, Go! : What is wrong with this picture? 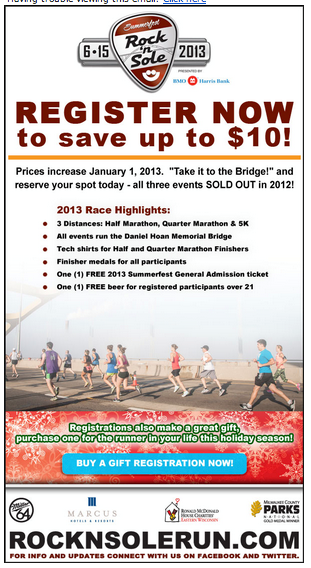 I got this email yesterday morning from someone named "Summerfest Rock 'N Sole Run." I don't know about you, but I get these things with some regularity. This one caught my eye, though. Do you notice anything missing from this advertisement? Like, for instance, the location of the race? Is this an oversight? Do they assume we'll just know (from the Daniel Hoan Memorial Bridge)? Or are runners just so desperate for races that we'll register for anything, anywhere, and travel if we have to? LOL! Too funny that you are posting this, because I got this too and had no idea what is was and immeditaly unsubscribed. A lot of times I have noticed ads for races that do not say where they are. Yeah... that really makes me interested!!! The company that does this race does them in several states. I never noticed it didn't say the city, but I live in Milwaukee and ran the race last year. 1. The Allstate "13.1 Marathon" - um, 13.1 is not a marathon. "Marathon" is not synonymous with "race". 2. The Rock and Roll "mini marathon" - this race is a 5k. I can't even formulate my thoughts correctly to comment on that so i'll leave it all to you guys. I'll echo MS - I've seen the "mini marathon" or "marathon" designations on things other than a marathon and it annoys me to no end. I also dislike the "stick this card under your windshield" approach when I'm at a race. I'm not signing up for your race on the same day I just ran one! Give me a minute! I live in Milwaukee and also ran this race last year. I wonder how you got on the mailing list for it? I do think that their target market was the immediate Milwaukee area, who have to be living under a rock to NOT know about this race. It was a huge clusterfu*k in 2011, 2012 went great, and prior to that it took YEARS to get approval to allow runners to run across the bridge. Also, Summerfest is kinda a big deal (personally, I don't get it) so, they might have thought that just putting that on there was enough. I still think it's really stupid that they didn't list Milwaukee on the email flyer. Whoops!